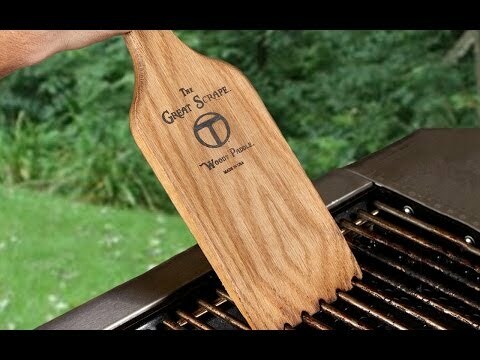 The Great Scrape is an all-natural BBQ cleaning tool with custom grooves that wear over time for a perfect fit with any grill. Dimensions: 16" x 4.75" x 0.75"
Dimensions: 18" x 4.45" x 0.75"
Dimensions: 20" x 4.75" x 0.75"
Gave one to my brother and to my brother in law. They both must use them because they look all grooved ad used! The person that received it, it does an excellent job of cleaning the wire grill. Preparing food on the barbeque requires fewer pots and pans than oven baking or cooking on a stovetop. But that doesn't mean that you can wash your hands of clean up duty. Now, there's a safe, simple way to avoid charred debris and buildup on the grates of your grill. After accidentally ingesting wire from a metal grill cleaner, Andy Stadick teamed up with his brother and fellow grill guy Nathan Thompson to create an all-natural solution. 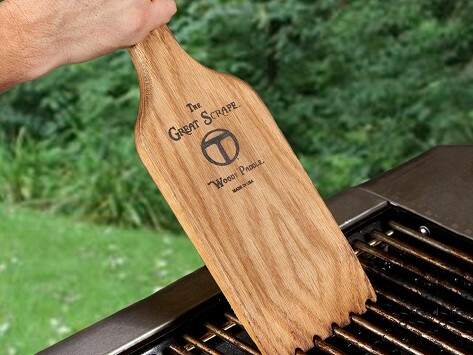 Made in the USA of solid hardwood coated with a non-toxic, food safe mineral oil, the Great Scrape cleaner actually molds to your barbeque grates forming grooves customized specifically to your grill. Put an end to grimy grates and metal brushes with a grill cleaner as effective as it is aesthetically pleasing.